ALUTECH ARE ONE OF THE LEADING MANUFACTURERS OF ALUMINIUM SYSTEMS IN THE WORLD. Their decades of experience producing the highest quality aluminium products for doors and windows make their knowledge coveted and their accolades prestigious. Scaling down their work for multinational corporations and international businesses, they’ve designed the BF 70: a masterclass in bifolding door technology. You’ll see more of the outdoors than through any other profile with straight lines on 120mm thick. Combined that with being PAS24-approved & you’ve got the most secure door with the widest vistas possible. It might not come as a surprise that these high quality specifications also have the maximum possible insulation value and weatherproofing available on the market – Alutech Systems meet or exceed every industry standard to keep you warm, dry and breeze-free. With such slender frames other providers might make you compromise on colour, but we can give you your Alutech bifolding door system in any one or even two RAL colours of your choosing. We’re in the business of letting you choose to make your home yours, right down to the shade of your frames. Speaking of shade, Alutech systems are also capable of supporting an industry-leading sash size of 1200mm in width, so you can decide when the sunshine fills your living space. It’s all about letting you choose what your home looks like without compromising on any aspect of design or quality. No matter whether you’re trying to open up your kitchen into your back garden or turn your back wall into a widescreen view of your porch, you can have it your way every time with Bi Folds Bi Design & Alutech Systems. Enjoy up to 14 panels of door to occupy even the widest spaces and treat yourself, and your family, to the home improvement you’ve always wanted. We believe the Origin folding door to be one of the very best doors in the UK. Manufactured exclusively by Origin, 100% British, these superb bifolding doors offer you class leading design, an exceptional guarantee and a host of features designed about you. 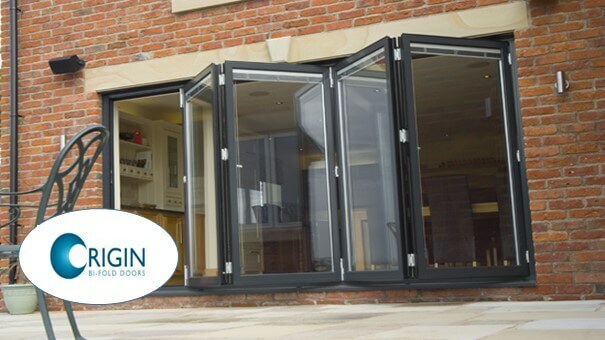 Origin bifolding doors are suitable for any type of property. You can choose from a huge choice of door opening options, from 2 pane folding doors right up to 8 pane doors. In addition we offer the stunning open corner bifolding door. Y0u can choose from doors that open in or out, slide to the left, to the right or in opposite directions. You can even choose bifolding doors with access leaves or French doors to give you highly accessible and versatile doors without having to slide all the leaves back. It makes absolute sense that with a door having more panels than a french door or sliding door, finger protection should be built-in. Look closely at Origins superbly crafted bifold door and the joints between each folding panel feature an anti-finger trap design. If you have little children or even for adults you’ll appreciate the importance of a safety feature which stops fingers getting trapped. They make this possible thanks to clever engineering and thoughtful design. Their doors feature a customer designed interlocking joint gasket. Specially made from a durable yet flexible thermoplastic elastomer it avoids any gaps that may cause a finger trap situation. Thanks to advanced aluminium profiles and high specification glass you new Origin bifolding doors will keep the warm in and the cold out. Origins thermally insulated frames work with our toughened, coated and argon filled glass units to maintain a stable temperature. In the winter months this will keep your home warmer and help reduce your energy bills whilst still giving you light, space and great views outdoors. For new build constructions or extensions, Origin doors exceed current Building Regulations L1 and L2. They’ve been independently tested by The British Fenestration Rating Council to a U Value of only 1.67Wm2K in accordance with current ISO Standards. Bifold doors with superior locking. As so many folding doors are installed at the rear of the home, peace of mind security is paramount. Study their doors and you’ll notice a custom designed multi point locking system. Not only does it feature deep throw hooks but also full height faceplates, anti-bump cylinders and ultra secure handles. The remaining leaves feature secure shoot bolts and high security hinges. Orgins bi-fold doors have been tested to the stringent “Secured By Design” standards established by the Association of Chief Police Officers. You can enjoy peace of mind that our doors are not only beautiful and functional but also highly secure. Bifolding doors to be enjoyed not maintained. Thanks to the finest materials and sophisticated hardware, our exceptional bifolding doors are designed for enjoyment with minimal maintenance. A simple clean of your durable powder coated frames with a mild soapy solution is all that’s required to keep them looking like new. A twice yearly application of silicone spray is all you need to do to keep the gaskets supple. For the locks and hinges simple lubrication a couple of times a year will keep your doors folding and locking as they should. The unique free glide running system is what enables your doors to open an close with a minimum of effort. Despite their advanced designed this is totally maintenance free. Only routine cleaning of the track is all that’s required when you frequently open and close your doors. Creating the seamless link between the inside and out. 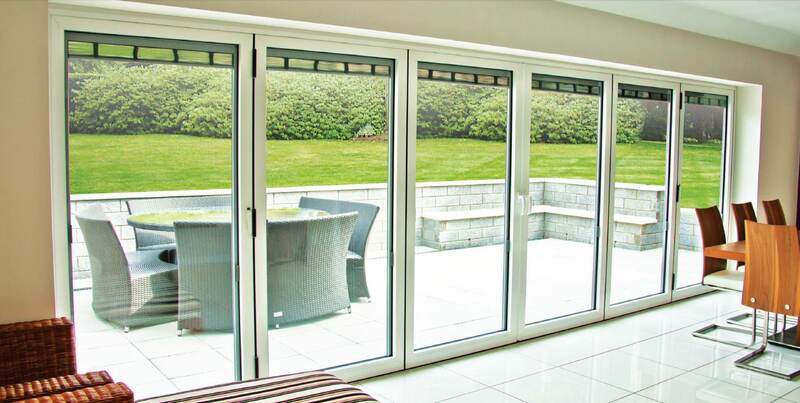 One of the benefits of having a bifolding door is how they can connect the inside to the outside of your home. To make this happen a well designed threshold is important. The threshold on an Origin bifolding door has been carefully through out to cover most requirements. The threshold is already one of the lowest on the market at only 66mm high. But you can sink the base track of the frame into the floor to create an ultra low threshold with minimum ‘step over’. Every home is different. So deepening upon the inner and outer floor levels our threshold can give you a minimal height of just 12mm. How can large folding doors open so smoothly? A bifolding door can only be reliable if it is fitted with the very best hardware. Compare any folding door to a hinged door and you’ll instantly see how much more complex hinges and other hardware are. Orgins unique free glide roller carriage is specially designed only for their doors. It features a long wheelbase solid aluminium carriage with four wheels that run inside a low threshold base track. Each wheel is a little masterpiece in its own right. Made from the highest quality Type 6–6 nylon it resists heat, friction and degradation. Only the finest quality steel, fixings and other components go into making our doors that will work smoothly and effortlessly for years. This is why they’re the only ones with a 20 year guarantee.